Carolina's Herrera's fall 2019 collection opened with a stunning floral floor-length frock with a contrasting black and purple print. It was only the second collection from newly minted creative director of the brand, Wes Gordon — but it seems the designer has already found his stride, revamping the classically feminine house with a twist of approachable ingenuity. Here's everything you need to know about the show. 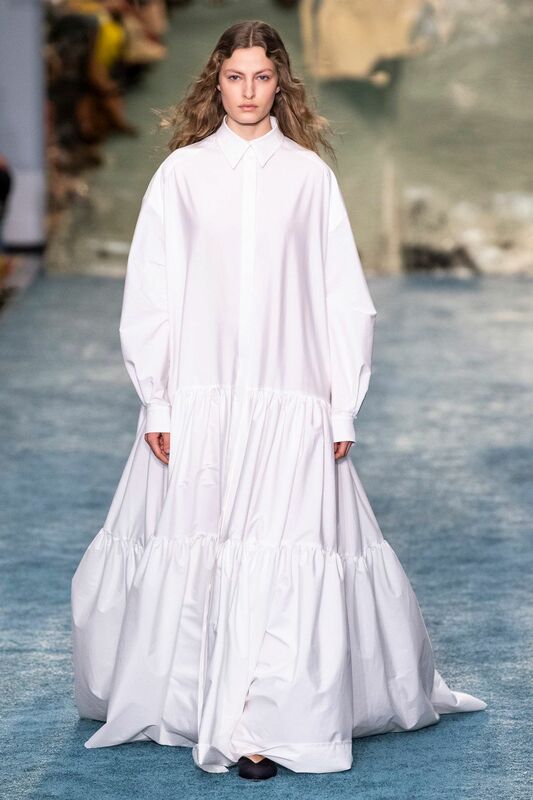 Though Carolina Herrera's pieces are often intrinsically formal, this season had an added bonus of having a few pieces that were distinctively sporty. The silk faille anorak, for example, served its purpose as a cute and bright dress but also a piece of functional outerwear. 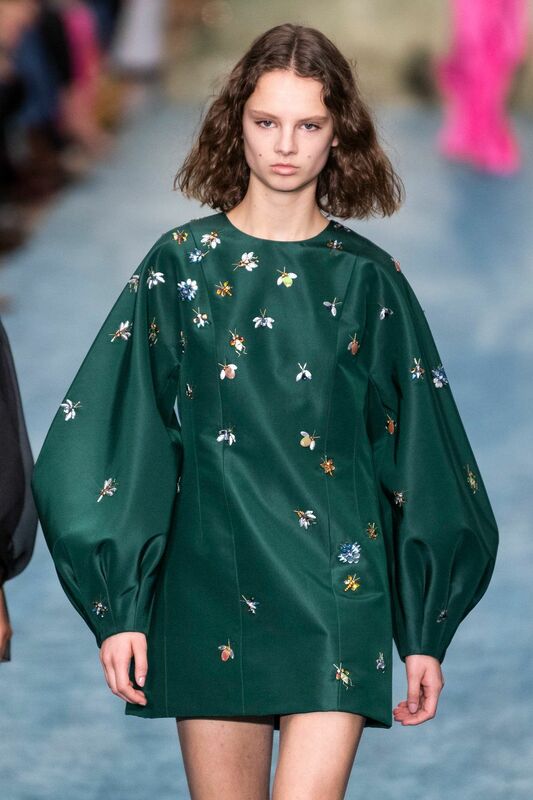 Mini dresses in solid silk hues like vivid orange or printed with little floral prints became maximalist pieces with the addition of wide, ballooning sleeves. A good number of the gowns in the collection were long-sleeved with an emphasis on sleeve volume. The floor-length maxi dresses that came in both bold shades and neutral white tones seemed to float across the runway. In the hands of Wes Gordon, they were basically reinvented shirt-dresses (that came with all the buttons) and volume-heavy, tiered bottoms. The overall color palette of the collection was bold and bright. Deep yellows, neon pinks, warm oranges and cool corals dominated the runway and make a statement, especially given these colors are so often relegated to spring collections rather than fall. It felt refreshing to see literal bursts of color in this context. 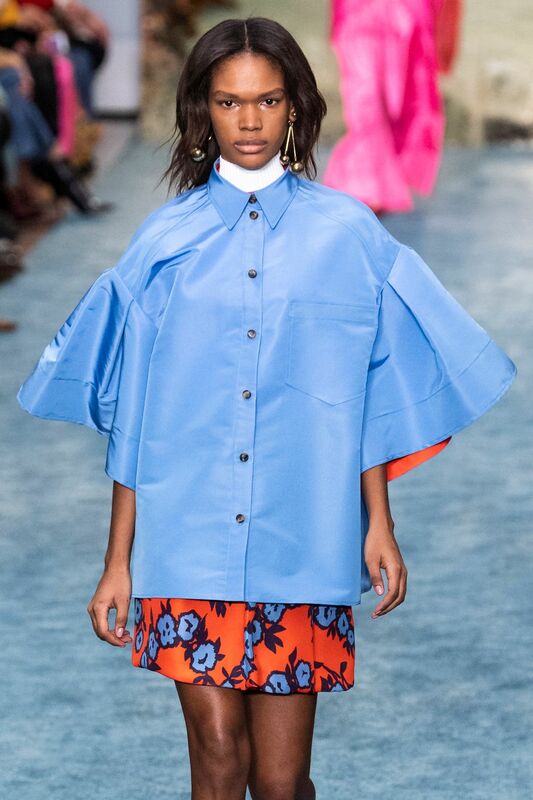 In such a colorful collection, there was still one look that stood out above all else. 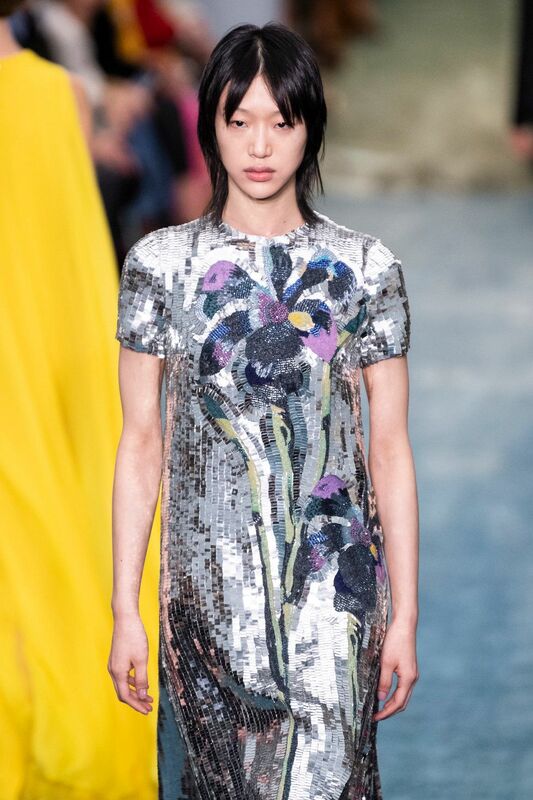 The one sequined dress in the collection shined in silver and reflected light all around the room. Two simple flowers — in blue, black and purple sequins — were embellished on the front.